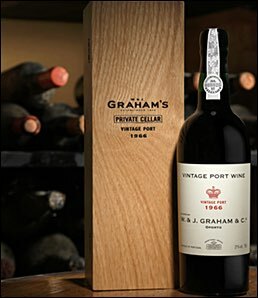 Graham’s is releasing the last 104 bottles of the Symington family’s private stock of Graham’s 1966 Vintage Port, which has been cellared in perfect condition for half a century in the Graham’s 1890 Lodge in Vila Nova de Gaia. The 1966 vintage is considered one of the finest of the second half of the 20th century and has now reached an extraordinary level of balance and maturity. The year was one of low yields but of exceptional quality: a wet winte r and spring replenished water reserves in the soil and this proved crucial to sustaining the vines during a hot August, with temperatures twice rising above 45degsC. Some unsettled weather briefly interrupted the harvest but the grapes swiftly recovered and were delivered into the winery in perfect condition. With a delicate crimson core and a soft red rim, this unique vintage port has the classic Graham balance and elegance, combined with aromas of mature red fruits and touches of eucalyptus and mint. Smooth and complex on the palate with very fine tannins, the finish is long and demonstrates the extraordinary complexity of a magnificent bottle-aged Vintage Port. Charlotte Symington comments: “Very rarely is it possible to enjoy a wine of such age and quality. We are proud to be able to offer this unique opportunity to taste one of the finest vintage ports ever made”. Olivier Clausse, head sommelier at The Goring adds: "I am truly honoured to be able to offer our customers at The Goring such a rare and exceptional vintage as 1966 coming directly from the Symington family." This wine was professionally re-corked at the Graham’s Lodge in April 2015.